“I am the first in my family to graduate from college. My fourteen siblings root me on and I want to be a strong role model for the younger kids in my family,” Shamia Boone said. Shamia graduated from Patterson High School in 2010; completed her AA degree in Biotechnology at Baltimore City Community College in 2015 and; received a BS in Psychology from Morgan State University in 2017. Busy young lady! “A friend recommended me to the Healthcare Careers Alliance and I started there in August of 2012. 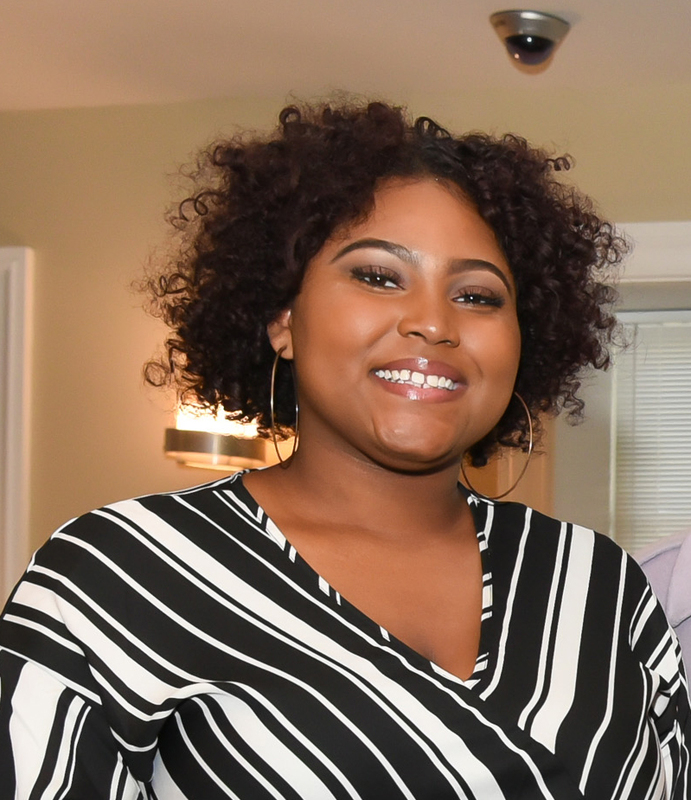 I attended job readiness classes and a 7-week paid internship at the University Of Maryland Medical Center (UMMC),” Shamia said. The Healthcare Careers Alliance (HCA) is a funded collaboration between Sinai Hospital/VSP and Civic Works. It is funded by the Mayor’s Office of Employment Development. The program’s goal is for each participant to be hired in a training- related, entry-level position or to enroll in higher education upon successful program completion. HCA, provided to Baltimore City out-of-school youth between the ages of 18 and 24, consists of job readiness training, occupational training, job placement and job retention. After the internship, Shamia was hired right away by UMMC to work in their pathology lab. Today, after six years, Shamia is a Clinical Laboratory Technician Assistant II. “The great thing about HCA is that it is a clear and direct path to a real job in the health industry. You just have to show up and stay focused,” Shamia said. Shamia also works for an institution that provides special education, therapeutic and related services to students K-8. “I want to get back to my interest in psychology and combine that with my interest in research,” Shamia said. The field of psychometrics is a growing field where psychometricians measure the validity, reliability, and fairness of an exam’s program to create a valid and reliable test. “I am currently focusing my research on childhood adversity exams and how a community responds to adverse children,” Shamia said. Once she is eligible for tuition remission Shamia will complete her Masters in Psychometrics at Morgan State University. “I love working with children and providing help because I understand that education and aide is an important asset to life. My students are learning and growing and that’s what matters the most. They try so hard and they learn so much, they will forever be the light to my life,” Shamia shared. Shamia is highly engaged in her community and it is important to her to give back. She is a peer mentor at Morgan through the EVOLVE organization – Elevating Voices of Leadership, Virtue and Excellence, and a member of Sigma Alpha Pi. “When I look back in life, I remember that my family gave me little help and I just knew I wanted more. I am naturally motivated,” Shamia said. “I tell other youth who are struggling to look within yourself because the answer is there. And then I say just watch me, this is how you do it!” she added. Mary Carter’s priorities changed when she had a child as a teenager. Maintaining a full-time academic schedule was too much of a challenge and she dropped out of school. It was ten years later when Mary finally completed her high school studies. “I don’t know what direction I might be going if it weren’t for YouthWorks. It has made the difference between a job and a career for me,” Taylor Jones said. In 2010 Eric McKnight became disengaged with traditional school where he said there just wasn’t enough help or support to keep him focused on academics. He heard about YO Baltimore from a family member and didn’t waste any time between leaving his high school and enrolling as a member of the Eastside YO Center.